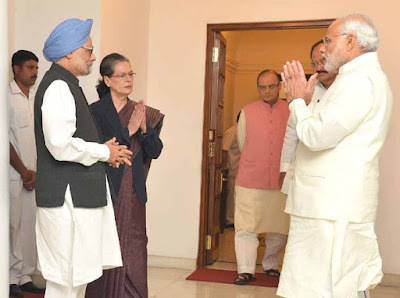 New Delhi : In a move to reach out to the main opposition for the passage of key legislation in parliament, Prime Minister Narendra Modi on Friday met his predecessor, Manmohan Singh, and Congress president Sonia Gandhi at his official residence here. “Former prime minister Manmohan Singh and Congress president Sonia Gandhi meet PM. Top ministers are present at the meet,” the Prime Minister’s office tweeted. Finance Minister Arun Jaitley and Parliamentary Affairs Minister M. Venkaiah Naidu were at present during the meeting.